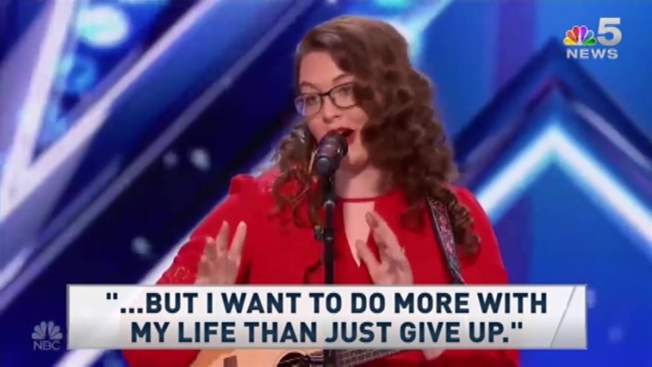 When Mandy Harvey took the stage on “America’s Got Talent” carrying her ukulele, she appeared as yet another singer stepping in front of the judges to share her voice. And she did. The only difference is, she couldn’t hear it. The 29-year-old deaf singer-songwriter who was born in Ohio and raised in Colorado lost her hearing when she was 18 years old due to a connective tissue disorder, which deteriorated her nerves. She had just begun studying vocal music education at Colorado State University when she says she got what she thought was an ear infection. “It just got worse and worse and by Christmas I was borderline legally deaf in both ears,” Harvey said. She ultimately left the music program and continued to study education. “Everything that I’d ever wanted was just going away and I couldn’t stop it,” she said. Harvey, standing without shoes on the AGT stage, uses her feet to feel the tempo through the floor then sings using her muscle memory and visual tuners. Harvey went on to perform a song she wrote called “Try,” a song she said was inspired by her journey back to music. "After I lost my hearing I gave up but I want to do more with my life then just give up," she told the judges. “I don’t think you’re going to need a translator for this,” judge Simon Cowell said seconds before hitting his golden buzzer, sending Harvey through to the live rounds. An emotional Harvey walked off the stage in shock. “What just happened?” she shouted.